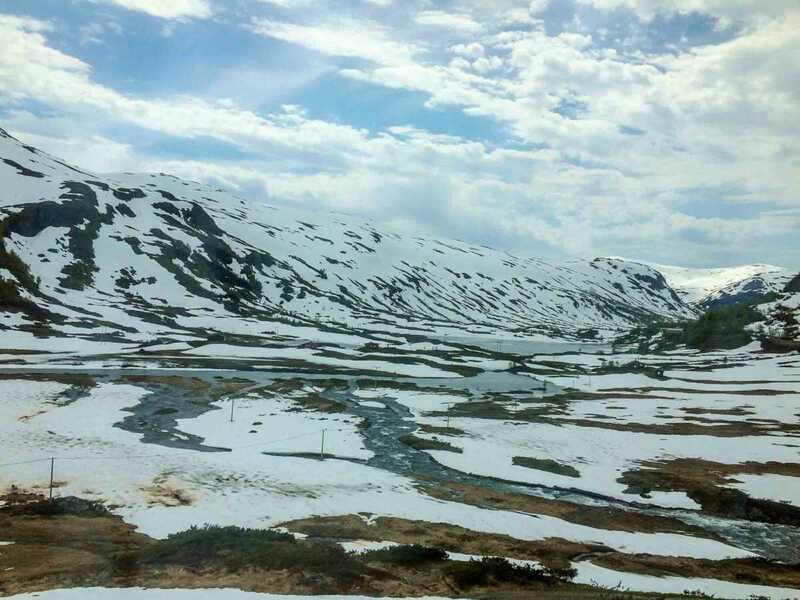 Cross country on Norway’s Bergen Railway offers long views of snow, waterfalls, rivers and lakes. And skies. Long story short, I found myself in Oslo, Norway, with a Eurail pass and a week to spare before my flight back to the U.S. It was midsummer (June 27-July 3, 2015) and my only plan was to get all the goodie I could from my train pass. I found all that on the Bergen and Flåm Rail lines. According to family lore, there is not a bit of Norwegian blood in me. Being half Swedish, there’s apparently no room for other Scandinavian strains. But my name and Minnesota upbringing make me appear at home there, and Norway seems fairly familiar to me, even on this first visit. I quickly found myself doing double takes, recognizing the faces of avuncular men and responding to the lilt in women’s dialect. The scenery, though, apart from some lush river valley farmlands, is distinctive and huge: long views, steep mountains, deep fjords, and seascapes…nothing like home. I’d hoped to travel up the coast of Norway into the Arctic Circle, but my week’s time dictated the itinerary. I’d take the train west across the country from Oslo to Bergen and back. This stretch of scenic railway, 370 kilometers long (230 miles), is included in the Eurail Global Pass. With two days of travel, I’d still have two days in Bergen to poke around and see the western coast. 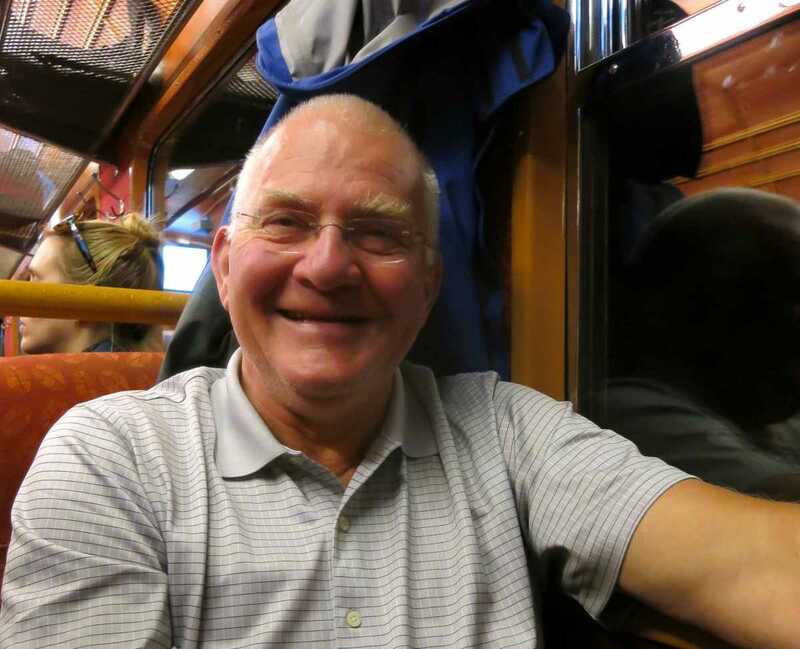 Everyone on the Flåm train should be so lucky as to have Harald narrating the play-by-play. This is a busy time of year for travel in Norway (think long days, not Northern Lights), so I checked at the train station for advance purchase. 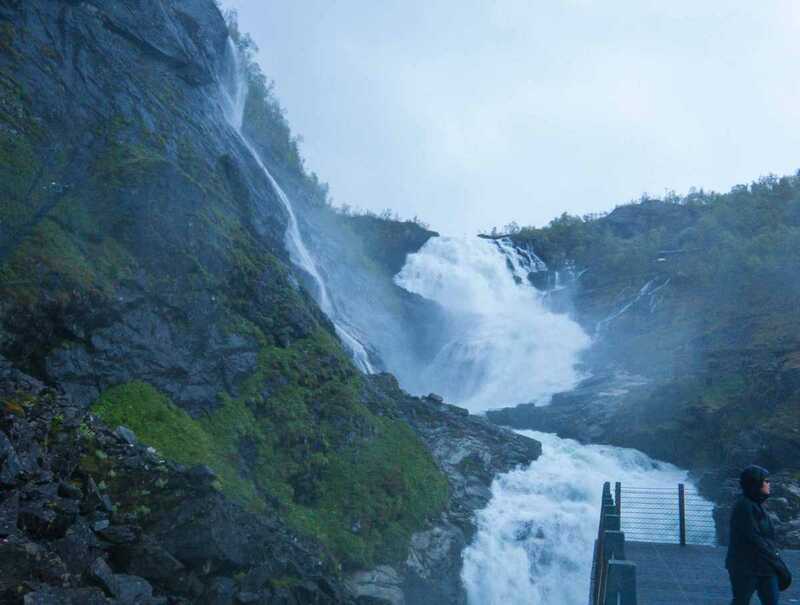 Many visitors purchase a tour package called Norway in a Nutshell, seeking the special Flåm train tour which is not included in Eurail’s pass. The Flåm Railway sidetracks from the main Bergen route for a steep train trip down to the Aurlandsfjord and Nærøyfjord fjords. From the train ride and a boat connection through the fjords, passengers are collected by bus to return to the main railway at Voss. I learned I could just buy the Flåm/fjord ticket on my own, no problem, as an add-on to my rail pass. The Global Eurail Pass is good in some 28 countries. But not all train systems are created equal. In Norway, trains are (not surprisingly) clean and comfortable, with upholstered seats and in many cases no distinction between first and coach class cars. On the Oslo-Bergen route, which takes about seven hours, first class cars don’t offer food service at your seat, but coaches have a self-service coffee and tea station. The Bergen Railway is known as one of the world’s great scenic rail segments, but it’s used for practical reasons by business people, families, and locals, as well as tourists. With my custom built ticket, I got off in Myrdal to catch the Flåm Railway. A couple train cars were reserved for those who’d booked the Norway-in-a-Nutshell package. After some confusion and checking with the platform staff, I found the car with open seating and grabbed a place with an older couple. My lucky seat! 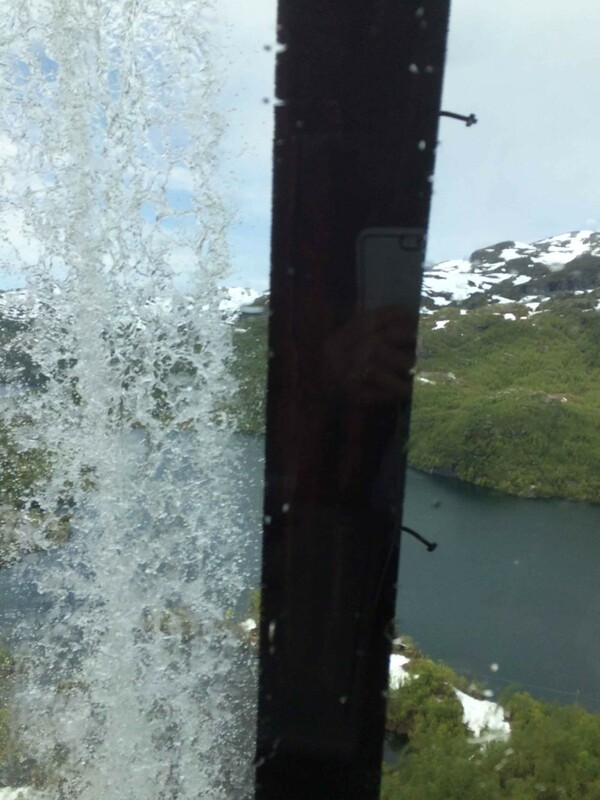 The Flåm train stops briefly so that passengers can get photos of the waterfall–if their cameras aren’t soaked first. It turns out I was sitting with Harald and his wife, who were locals. They’d walked to the train station from their cabin on a nearby lake, and were going down to the grocery store in Flåm. About a quarter mile out of the station, Harald pointed out the house he was born in. That’s about as local as it gets. His wife smiled patiently as he talked about hauling supplies across the lake or ice, winters at the cabin, and being buried by snow. They don’t attempt to live there through the winters any more. So I got to hear the specifics from someone who knew every twist and turn in the track. The Flåm railway includes 20 tunnels, totaling 6 kilometers, in its 20 kilometer run. One tunnel drops so much it is formed into a figure eight. Harald could tell me how many seconds I’d have at the next opening to shoot a photograph. “Out the other side, you’ll have 14 seconds, in about a minute.” As we descended to the town and ran along the river valley, we talked about last year’s floods–the highest water in Harald’s lifetime. Three houses washed away; Harald’s elementary school in Flåm was closed for a while, and bridges were wiped out. These eight months later, the course of the river and roads was just being reestablished. The vulnerable town of Flåm shows signs of the severe flooding from October/November 2014. Spring comes late to Norway. In Oslo’s botanic garden before I set out by train, I was surprised to see what we call May flowers (peonies, rhododendrons, lilacs) just blooming in late June. The floods, remarkably, were in late October when the last snow melt combined with rain to set the episode in motion. 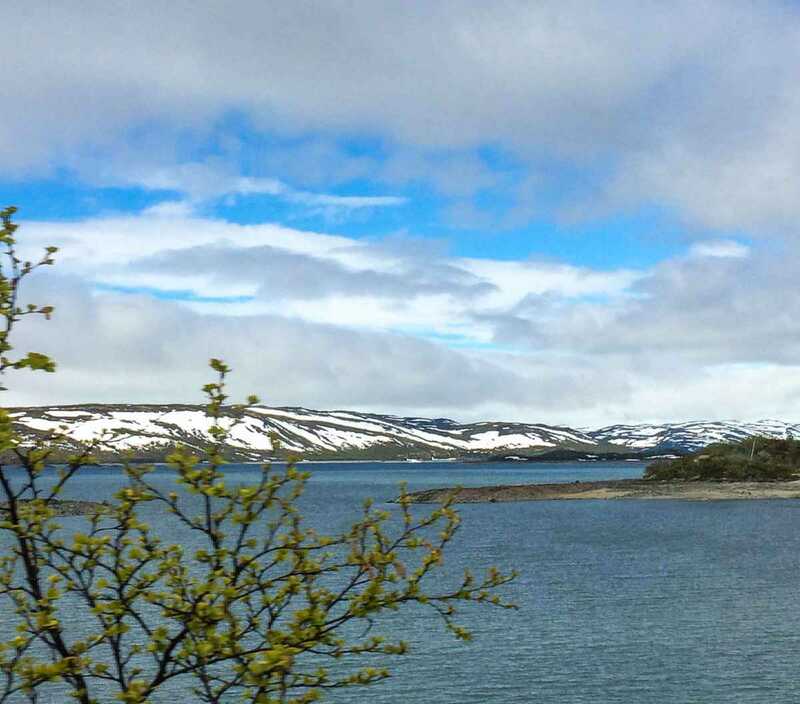 From Oslo sea level to Bergen sea level, the train route climbs to 1222 meters (over 4,000 feet) at Finse. The alpine tundra changes quickly and dramatically along the rail line, and it’s hard to stop taking pictures. Long views of mountain snow and peaks sliced by narrow waterfalls are off in every direction, so that many of us roamed the train car for alternating views, north and south of the tracks. Western fjords in fog, between the Flåm train and the Bergen Railway. Once down on the fjord (Western Norway fjords are designated a UNESCO World Heritage Site), the focus is the water, the deep blue green path through walls of rock and pine, the sky, the light, and the little isolated towns between the cliffs and coast. My travel day was rainy and not conducive to photos nor deck chairs. An American family disembarked at Aurland for a family visit. Fishermen and port workers waved to us at Undredal. We saw a few kayakers on the last leg. I really didn’t want this part of the journey to end, but boarded the bus to be driven to Voss, where we caught another train bound for Bergen. Undredal, a port of call on the fjord, is backed by impassable mountains. This is the snow that melts into rivulets, that join into waterfalls, that flow into rivers that flood the towns. In many sections of the Bergen Railway, the train balances on tracks on the side of the mountain, even passing under cascading water. Fantastic narrative!! And the photos are simply breathtaking. I really enjoyed reading about Norway. I appreciate the comment, Marilyn. You are inspiring me to visit the fjords of Alaska. What a beautiful story and such a lasting memory of a beautiful country. I like train travel for these serendipity type moments. I can’t think of another experience that combines relaxation with thrills quite the way train travel does. Thanks. The flam railway looks and sounds absolutely lovely! We’ll be in Scandinavia next summer, so I think I’ll be adding it to our plans! Rachel, please do message me before your travels. I’d love to chat about your itinerary, and share some favorite places. What a lucky seat to have in the train! It always helps when a local shows you the ropes. 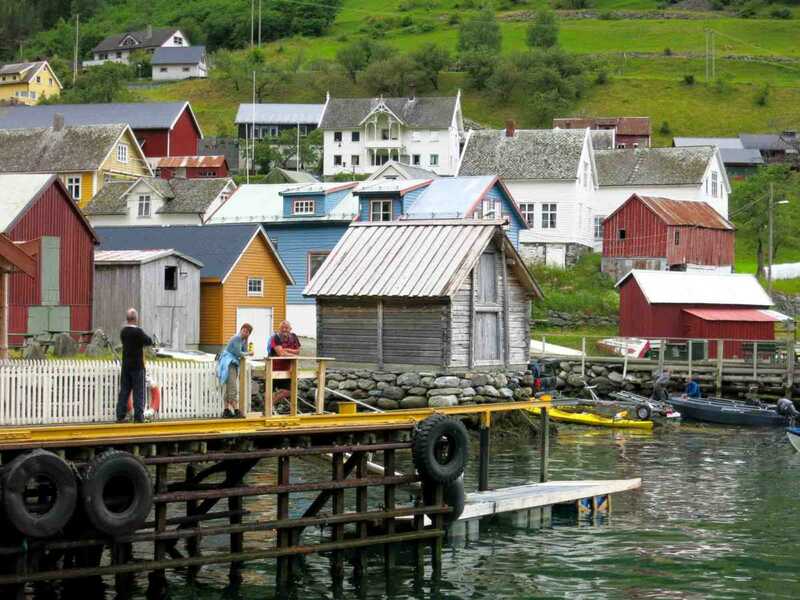 The train strip sounds fabulous and a far better option to get to Bergen than flying. I hadn’t realised that it was included in the Eurail pass so thanks for the tip! Thanks, Jenny. We’ve seen so much more than we expected via Eurail. We’re about to visit Eastern Europe, and are looking forward to checking out train travel in that neck of the woods. I’m getting increasingly determined to go to Norway and now that there are very inexpensive flights there from Fort Lauderdale it’s really beckoning to me. Traveling by train seems so civilized and low-hassle that I think I’d do that so I really enjoyed this post. I’d never heard of the Flam Train and of course will remember it as the Flan Train, but that’s close enough! Harald sure did know his route – very helpful for taking the pictures. Kay, between your river travel and our train travel, we’re beginning to cover some ground! I’m campaigning for a name change to Flan Railway!! I found Harald’s email, and can’t wait to let him know you’ll be passing his way. So great that you found the Flam train. We absolutely loved it when we took it as part of the Norway in a Nutshell tour. I remember reading your post on the Nutshell experience, and that inspired me to travel from Oslo to Bergen, with the Flam detour route. It’s so gorgeous, I’m ready to do it again. Ahh, this took me back to the summer I was a high school exchange student in Oslo, many moons ago. 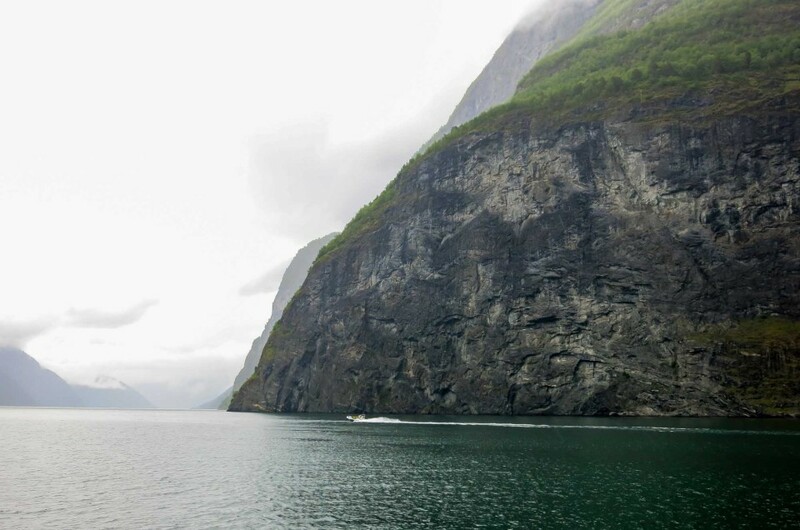 Flam was part of an extensive road trip the family I stayed with took to introduce me to the interior and the fjords. I would love to take this train trip and really appreciated your narrative. Thank you, Betsy. Does that mean you speak Norwegian, or did at one time? Do you still have connections in Norway? I was impressed by the friendly vibe and the current multi-cultural population. It’s a great place to explore. 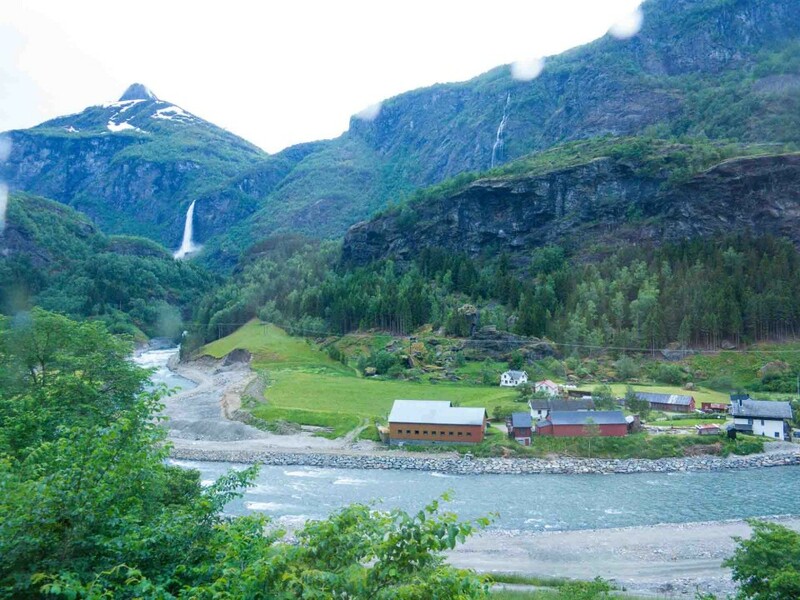 A lovely reminder of the time I went on the Flam railway. When I went a woman rose up from the mists of the waterfall and started singing – is she still there? Karen, it’s funny you should mention that! It was so loud and so wet, that I missed the performance! Others who ventured off the train at the falls assured me there were performers. To me, is was just a rumor of an apparition. Wha! I wanna go back. Yes, they are 2 ladies/girls from the Norwegian ballet school every summer from Late May to the end of August. Then they must go back to their studies. And this comment from THE Mister Harald F. as pictured with the story, Welcome to the post about you and your lovely homeland. Oh my, I want to be on this train journey in Norway, too! Rail? Check. Scandinavia? Check. Mountains + fjords? Check. You are right, Henry. This route has it all. I’m about to publish recommendations for stays in Bergen and Oslo, too. I saw so much in one short week! I love this! What a great story and what a beautiful country Norway is. Thanks, Julia. I’d love to hear more about your visit. I’ve finally posted more details about my stops in Bergen and Oslo. My daughter and I did this a decade or so ago. Absolutely beautiful. We stayed a night in Flam at the youth hostel there which consisted of little cabins within a big apple orchard. I wanted to stay much longer. Staying in Flam would be a great plan. Thanks for the suggestion.